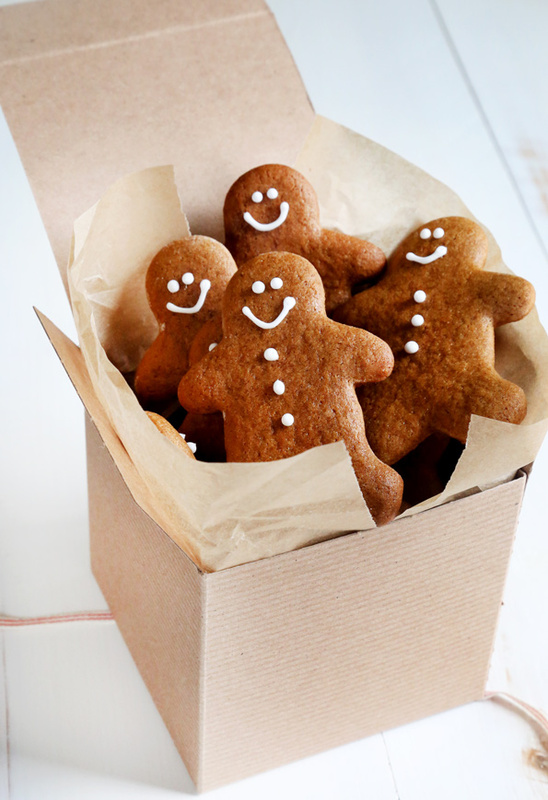 Soft and Chewy Gluten Free Gingerbread Men | Great gluten free recipes for every occasion. These gluten free chewy gingerbread men cookies are soft and perfectly spiced for all your holiday cookie-baking needs—or any time of year. I have a cookie deadline coming up, and it’s no laughing matter I tell you. There are cookies to be made! Each year, I make a box of Christmas cookies for each of the people on my husband’s team at work. This year, there are 17 cookie-eaters on the list (there were 18, but one person’s freelance contract was up last week and I’m a terrible person because my very first thought was that maybe I can make about 2 dozen fewer cookies and isn’t that a relief?!). Since there are just.so.many.cookies.to.make, I scaled down the boxes this year to 4-inch squares. These soft and chewy gluten free gingerbread men cookies are the sort of cookies you put on the top of the cookie box. They’re anything but cheater cookies. If you’re looking for more soft and chewy gluten free cookies, be sure to check out my recipe for thick and chewy gluten free chocolate chip cookies. They’re a true classic, perfect for any cookie plate! 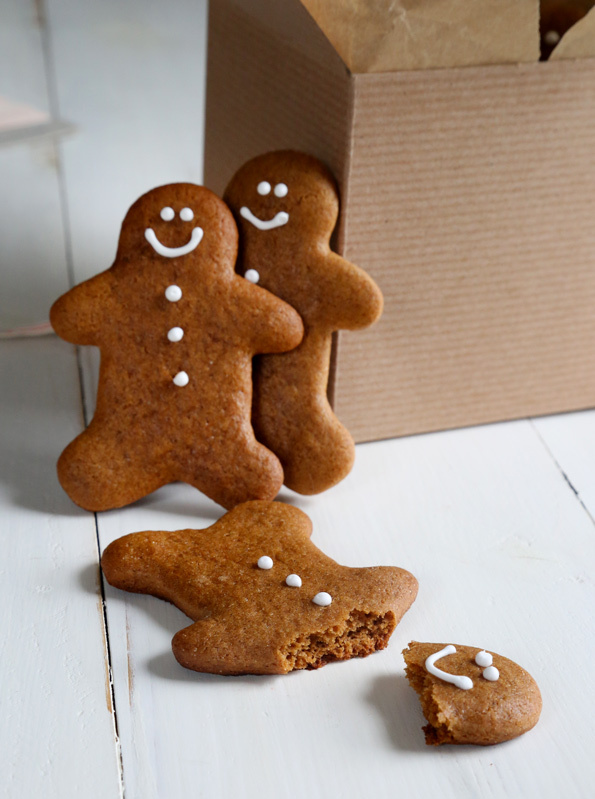 Now these cookies, they’re gingery and cinnamony, and they don’t mind a bit if you bite their heads off. Especially if it’s in service of showing their soft insides. Don’t get upset, but the dough is sticky. I know I know it’s not great fun to work with sticky cookie dough, but just follow my directions and it’ll all be okay. Simply roll out the dough between two sheets of unbleached parchment paper when it’s still soft (it will roll out nice and easy). Next, cut out shapes with a floured cookie cutter. Finally, place the dough in the freezer to firm up. That will make the dough easy to roll, and the shapes easy to transfer to the baking sheet. Trust me! Speaking of trust, I almost feel bad that these little guys are so peaceful and trusting. Right up until the moment when they get their heads bitten off. Or perhaps you start with the arms and legs, before you go for the head. So twisted, yet so delicious. The holidays can be confusing! By the way, if you’re looking for cookie cutters, I seem to find the very best metal cookie cutters in (of all places) my local hardware store. I know! Crazy, right? I’m thinking about doing a post with all my favorite kitchen equipment, large and small, what brands I like best, and where I buy everything. Like the baking pantry post, but about equipment. In a large bowl, place the flour, xanthan gum, baking soda, cinnamon, ginger and salt, and whisk to combine well. Add the brown sugar and whisk again to combine, working out any lumps. Create a well in the center of the dry ingredients and add the butter, molasses, honey, egg and vanilla, mixing to combine after each addition. The dough will be thick and sticky. Transfer the dough to a large sheet of unbleached parchment paper, cover with another sheet of parchment and roll into a rectangle about 3/8-inch thick (more than 1/4-inch, less than 1/2-inch). If you are concerned that the dough will be difficult to handle, place it in the refrigerator or freezer after you roll it out to allow it to firm up. 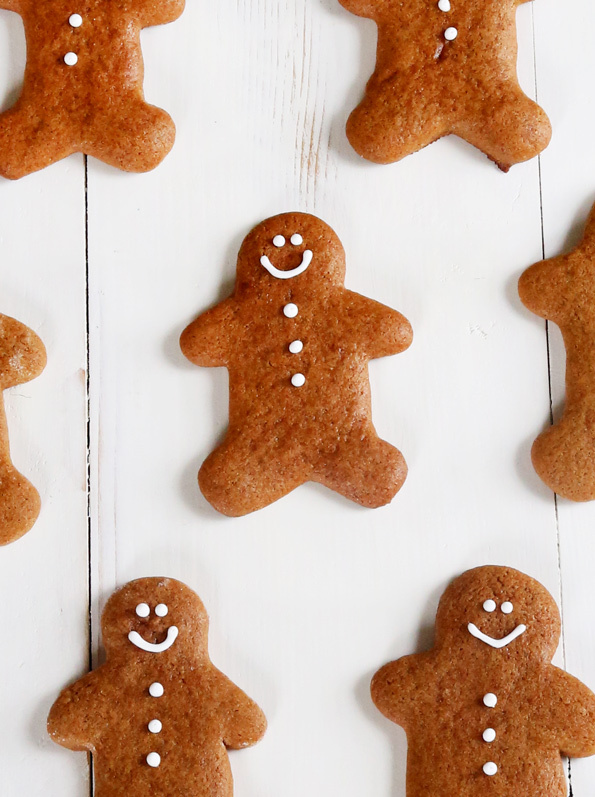 Pull back the top sheet of parchment paper, dip a gingerbread man cutter in all purpose gluten free flour or cornstarch, and use it to cut out shapes from the cookie dough. With each cut, jiggle the cutter back and forth to create a neat shape. Place the dough on a flat, portable surface like a cutting board and place in the freezer until firm (about 10 minutes). Once the dough has chilled, peel back the rest of the dough from around the cut-outs and gather the scraps. Then carefully peel off the cut-out shapes and place them, about 1 1/2-inches apart, on the prepared baking sheets. Repeat the process with the remaining dough until you have used it all. Place the cut-outs on the baking sheets in the refrigerator or freezer until firm (about 20 minutes in the refrigerator, or just 5 minutes in the freezer). This will help them keep their shape during baking. Place in the center of the preheated oven and bake until just set, about 8 minutes. Remove from the oven and allow to cool completely on the baking sheets. Decorate the completely cooled cookies with royal icing, if desired. Allow the icing to set for 24 hours before stacking the cookies. These!!! These are SOOOOO good! Soft and melt in your mouth! Hard to not eat all of them. Awesome job, Nicole! Thank you! This saved Christmas. :) My old gluten ones were soft and chewy and I couldn’t find a soft and chewy gluten free recipe. So grateful that you provided one! I would love to see a post about your favorite kitchen equipment! Can I leave the molasses out? My all time favorite cookie with a nice cup of hot tea. Thank You ever so much. We have egg allergies in our home… and normally just drool at the yummy pictures you take and dream over your recipes. However, these cutie cookies are sooooo adorable, that I just had to write and ask if you think they will work just as well if we swap in the equivalent of 1 Energy Egg Replacer powder egg for the chicken egg? if yes, should we weight the liquid and powder together to get 60 grams, or just go with the instructions on the box for 1 egg substitute? Or- should we use something else entirely as a chicken egg substitute here…? It would be so super duper amazing if you could offer specifically tested egg replacer substitutes for each for each of your recipes. As you are the absolute “Gluten Free on a Shoe-String” queen :D I’m sure you understand our family’s financial challenges while trying to experiment with which egg replacer idea would work for every recipe we want to try and eat. Boy, was it exhausting. Financially and emotionally for my family…We were wasting so much money experimenting with egg replacing last year, that I eventually had to stop baking in order to keep within our food budget.. I heart you Nicole! I have all of your books in kindle and hard copy! (and a pre-order for the next one) THANK YOU so much for sharing all these great recipes on your blog!! Love all your posts and look forward to the kitchen equipment one! I am not a Christmas cookie baker. If I do them, are they able to withstand being shipped to family across the country? Are there specific ones that can be shipped? Yes, would love a kitchen equipment post! A tip that comes from years of creating with gingerbread. Turn your cookie sheet upside down and roll the dough out on that side. Yes, I mean the bottom of the cookie sheet. There are no sides to get in the way. Cut out the cookies and remove the unwanted dough. Bake in this position. Works every time. I have never found that gingerbread expands so much that it spreads into the neighbouring pieces. Claire, that’s an interesting tip, thanks for that. 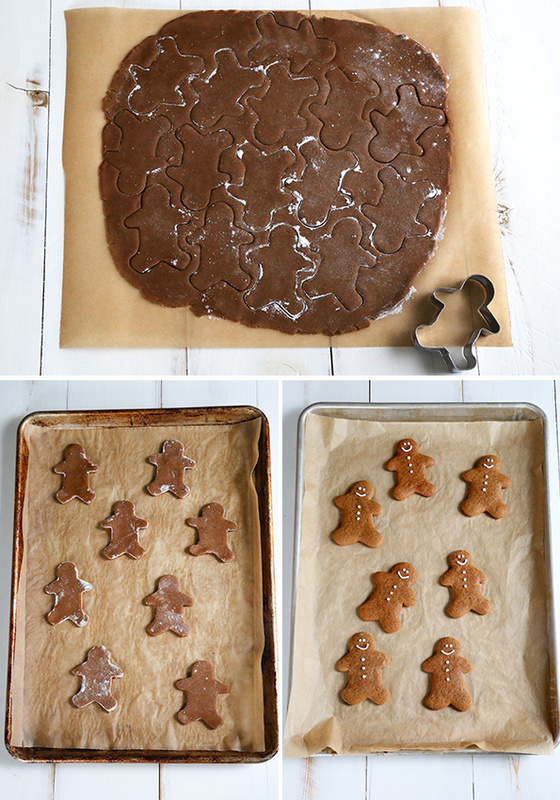 But this recipe definitely does spread, as these are soft and chewy gingerbread men. If you don’t have any space between them, they will bake into a mass! Yes please – that would be an awesome post! These are so cute. I may have to add them to the list! :) Thankfully now putting in the freezer means popping them out in the garage to me! :) lol! Yes, I’m also making cookies for gifts this year! I have made up a bunch of knitted mug cozy’s and filling each mug with GF Christmas cookies. The cookies have to be small round ones in order to fit in the mug! I’m going to have to make these asap. BTW I’d love a post about your favorite kitchen equiptment!